For some naturals it's easy to get caught up in protective styling and forget to let our hair down and enjoy it. Angela Simmons can usually be spotted rocking a hot sew-in, but recently showcased her full head of natural hair. Who says weaves aren't great at growing your hair out? After seeing the pic Angela posted (below left), I was inspired to post my own! 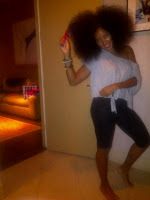 I was rocking my blown out fro around the house and having a Diana Ross diva-type moment. When's the last time you let your hair down?